Remember When This Fad Swept The Nation? I am writing a book on Preston Tucker and some of my research requires me to page through old magazines. One in particular, Mechanix Illustrated from August 1948, is well-known to Tucker aficionados because of a review of the Tucker '48 sedan by famed auto writer Tom McCahill. You might guess that the woman on the cover of the issue is not driving a Tucker '48. She's riding what the magazine promised was the latest fad - "Funny Cycles." While the Tucker sedan was quite newsworthy, this national craze was apparently more newsworthy. That's why it is on the cover. I wasn't around in 1948 so as soon as I was done reading the piece on Tucker, I flipped over to the three-page spread on these newfangled contraptions which I can only assume my parents drove on a daily basis. 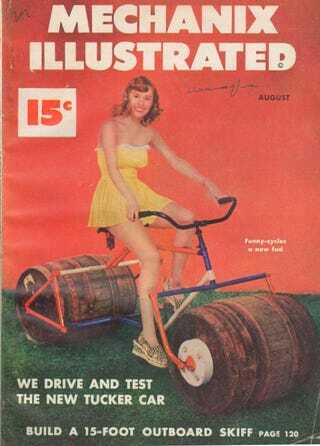 After all, these barrel-wheeled vehicles, and other wheeled oddities, were sweeping the nation. Oh my. I believe those are called gams. Even in 1948 the latest vehicles were marketed with eye-candy. Or, maybe bathing suits were the favored uniforms for the operators of the Funny Cycles. Obviously, the woman on the left is also a skilled operator of a Funny Cycle. That's why she's wearing the uniform. As I study these pictures I notice that the heels are apparently also part of the uniform. Like the way some drivers wore scarves and goggles when piloting motor-cars of yore. These funny cycles were still in their infancy and the leading scientists and engineers of the day were still wrestling with various design issues. Clearly, they have examined the spectrum, from the tiny wheels on the one end to the barrel and Eight-ball wheels on the other. Would there be a potential for a mid-size wheel, something between the trike wheel and the barrel? How about a smaller barrel? Or the other 14 balls in a billiard rack? The good news is that with the recent end of World War II, there was a glut of scientists who had been freed up from working on things like the Manhattan Project who could now address these pressing concerns. And, there was most likely a massive quantity of government funding available as well. It's been 65 years since this craze swept the nation. I'm sure there is a plethora of literature I can delve into later, just as soon as I finish the Tucker manuscript. In fact, I just wrote myself a note: "Check for SAE papers on Funny Cycles, Circa 1948." Maybe there's a book there. Steve Lehto is a writer and attorney. He wrote Chrysler's Turbine Car: The Rise and Fall of Detroit's Coolest Creation and The Great American Jet Pack: The Quest for the Ultimate Individual Lift Device.